Lore and urban legends seemed to shroud the facts surrounding cannabis until a decade ago. Information was limited, and the science and medicinal talk around this plant had barely begun. When Zoe, 40, was first asked to write about marijuana, she was living in New York City, where cannabis was very much illegal. Access to valid and truthful information was minimal, if it existed at all. These were only a few of the obstacles that she encountered as she began to break her way into this evolving industry. In 2015, Zoe moved to Portland for a change of scenery. Attracted to the mild climate, the openness of Oregonians, the liberal laws, and the freedom to indulge in cannabis legally, she was excited to be here. Surrounded by incredible pioneers at the forefront of the industry, she learned a lot and continues to learn from the plethora of amazing people she has encountered. Her desire is to continue working with her incredible clients with positivity and authenticity. She wants to continue pushing the cannabis conversation forward with intelligence and as much science-based knowledge possible. With articles published in non-cannabis magazines such as Esquire, Cosmo, and Good Housekeeping, Zoe is a force to be reckoned with. She is a regular contributor to Snoop Dogg’s site Merry Jane and was recently published in Rolling Stone. This amazing woman is a powerful advocate for the industry; She radiates a quiet confidence that is contagious, both in writing and in real life. Being raised on a farm with a love for growing all things, MzJill, 45, was a natural-born gardener with an impressive green thumb. When she was first introduced to growing cannabis, this single mother’s only intention was to save money by providing herself with product. As she homeschooled her children, they were taught to understand the science behind growing, along with the medicinal components and genetic breakdown of this incredible plant. Working as a teacher’s assistant for the Salem-Keizer school district, she would eventually leave her job to pursue cannabis breeding full time. As co-founder of TGA (The Green Avengers) Genetics, renown cannabis horticulturalist MzJill, teamed up with Subcool over a decade ago to begin developing new strains tailored specifically for the medicinal community. Focusing on the medical benefits of cannabis, TGA Genetics is working on providing strains to relieve a myriad of different conditions. With very small grow rooms, MzJill and her husband Subcool, keep things intimate to ensure the quality of their product. With thirty-seven (and counting) new strains created, this powerful duo is providing the cannabis community with award winning seeds. One particular strain created by MzJill was Agent Orange. She developed this strain to honor her father, a Green Beret in Vietnam who passed away from cancer caused from Agent Orange during the war. Her intention was to donate it to veterans who were suffering. It happened to be her most popular strain, Jilly Bean, which really captured the attention of vets, however. With seeds already being sold by the masses, MzJill’s current goals are to get their products on the shelves of every shop available. This innovative and dedicated woman is pioneering the cannabis seed industry, breeding some of the most fragrant and unique strains available on the market. With a desire to try her hand at something new, SuAnne decided to join the cannabis community in 2014 when measure 91 passed. 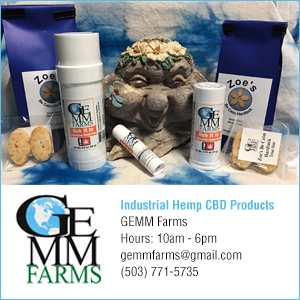 Knowing there would be opportunities in cannabis retail, she collaborated with her girlfriend, Tasia Rodgers, 33, as well as two friends, Jill Sorrels, 32, and Alicia Smith, 40, to create a dispensary in Salem with a unique atmosphere. Combining Alicia’s history with music and the extensive customer service experience of SuAnne, Tasia, and Jill, this team has designed a welcoming store that’s assumed a hip-hop vibe. This fun loving group of ladies have made a great impression in Salem, receiving high praises from the community and 5/5 stars from Weedmaps. With their second retail location having just opened in March, they are expanding rapidly, with goals to continue growing their businesses within Oregon. Keep an eye out for SuAnne and her business partners; they are an absolute pleasure to know and are setting a wonderful example of integrity for others in the cannabis industry to follow. Drip Ice Cream is a perfect combination of Andi’s passion for art, cannabis and cuisine. When this ambitious 26 year old visionary returned to Portland from pursuing art abroad, she quickly secured a job as an art director. With some experience in cooking from her time spent traveling, Andi continued to explore and create a variety of her own recipes here at home. The idea to infuse cannabis and ice cream was brilliant and one that Andi embraced completely. While she loved both making ice cream and consuming cannabis, the thought had never occurred to her that the two could be combined. Then, one day it hit her. Believing the best, Andi merged the ingredients and realized the incredible potential. After receiving a wonderful reception from friends and family, she decided she needed to share this commodity with the world. Her company, Drip Ice Cream, offers a variety of heavenly flavors: Salted Caramel, Honey Lavender and Cookies and Cream. Offering an option for vegans or lactose intolerance, Drip also concocted an amazing alternative with a non-dairy base: Coconut Lemon Zest. Available at two potency levels, you can choose the regular dose with 15mg THC or for the more tolerant, the extra strength containing 75mg THC. Using all natural rBST free milk, GMO free, fair trade and local ingredients, Andi understands our Oregon culture well. Prior to the testing changes that went into effect on October 1st, 2016, Drip Ice Cream was being sold at approximately 150 stores. Although the changes adversely affected this business, after a lot of dedication and hard work, Andi is now preparing to have Drip back on shelves by summer. With the expectation of surpassing the amount of retail locations she previously had, Andi’s ambition for Drip is to expand not only throughout Oregon, but nationally as well. With a desire to share this unique and delicious experience with everyone, Ms. Bixel is an inspiration and absolute delight to have in the cannabis community. A Pacific Northwest native, Koushi, 33, was vacationing from the East Coast during the early days of recreational cannabis. She had long anticipated experiencing legal marijuana and couldn’t wait to visit a local dispensary. After waiting for over 30 minutes, she finally reached the budroom, only to learn that she needed cash—a concern that had never crossed her mind! After begrudgingly running to an ATM, she returned to the dispensary and found herself with a condescending and hurried budtender, making her feel uncomfortable for asking questions. She left feeling disappointed. She knew from living in New York that there could be a better retail experience for cannabis consumers, and so began her brainstorming! Receiving her undergraduate degree from University of Oregon and her MBA from Dartmouth’s Tuck School of Business, Koushi was well poised to create a better retail experience for cannabis consumers. Today she is the CEO and Founder of Stemless, an online ordering platform. Stemless allows you to browse a dispensary’s live menu, select your products, and pay online, offering a cashless solution for the dispensary. You can elect to pick up your order, or in some locations, have it delivered! Growing up in Lake Oswego with a Catholic upbringing, Mary Lou, mother of three sons and a daughter, had minimal exposure to cannabis. Being in the event industry doing shows and networking for 28 years, when Oregon voted for cannabis legalization, she decided to change course. As the owner and operator of the successful wedding and event planning business called Bravo, Mary Lou was an expert at connecting professionals within an industry. Priding herself for partnering with businesses to help them flourish, she now leverages these skills and applies them to the cannabis industry. Networking and professionalism are both her expertise. As the founder of so many of the cannabis events in Oregon, our community can thank Mary Lou for providing a host of amazing networking opportunities. Bringing the CCC (Cannabis Collaborative Conference), as well as the OCGCF (Oregon Cannabis Growers and Consumers Fair) to our state, she has been integral in the development of our tight-knit cannabis community. Fostering an environment of camaraderie, Mary Lou has also created Cannabis Connex, which is a full-service cannabis concierge, helping to connect the industry with financing and so much more! Mary Lou has been called the “pot cheerleader” and the Angie’s list of Cannabis. Born and raised in Roseburg, Bethany, 35, pursued project management and marketing before her involvement in the cannabis industry. After moving to California for a few years, in 2012 – 2013 some big changes rocked Bethany’s world, causing her to move back home to Oregon. With her mother’s diagnosis of multiple sclerosis, Bethany launched into a personal research campaign; she started looking at the efficacy of cannabis as a complementary alternative for MS treatment. When she began researching medicinal cannabis to treat MS, she discovered that some pesticides could exasperate her mother’s MS symptoms. The risk of a person medicating with pesticide contaminated marijuana was a legitimate concern. Upon further research, she discovered that of the two labs in Oregon at the time, neither were doing much in the realm of pesticide testing. A light bulb went off. After collaborating with Dr. Rodger Voelker, who previously ran the pesticides department at the Oregon Department of Agriculture, she was on the right path for developing a lab with high testing standards. With the expectation that the high start-up and operation costs would deter many labs from opening, Bethany expected very little competition. However, this was not the case. During Bethany’s first year with OG Analytical, she encountered fierce competition. Without lab regulations, there was a window of opportunity for other labs to open with varying degrees of qualification. Many labs offered cheaper, faster testing and approved more products than OG Analytical. Running what’s called a liquid chromatography triple quadrupole mass spectrometer, they were the first lab to offer a comprehensive pesticide screen for cannabis. Because of this, OG Analytical failed many products that other labs had green lighted. With an invitation to participate on the OLCC Rules Advisory Committee for lab testing, Bethany was honored to be able to help implement some important lab regulations, including the requirement that labs must be ORELAP (Oregon Environmental Laboratory Accreditation Program) accredited. These requirements greatly reduced the number of qualified labs. In October of 2016, only four labs in the state could offer the full regulatory compliance panel, OG Analytical being one of them. Bethany Sherman is a pioneer in the cannabis industry. Her honesty and passion for consumer safety and awareness in the state has inspired action. Her tenacious commitment to quality standards and safe cannabis is paving the way for future industry leaders. Former Chicago prosecutor and current grandmother of two, Inge Fryklund, age 70, has observed too much injustice and futility in the “war on drugs.” During her time in the bond courts in the 1980s, she witnessed a vicious cycle of petty drug offenders being cycled back into the drug community. Because of their convictions, very few options existed for them in the legitimate economy, and they were soon back in court on yet another drug case. When her career brought her to Afghanistan in 2003, she encountered an even more devastating and destructive side of this criminal enterprise. With Afghanistan’s number one export being opium, (up to 90% of the world’s supply comes from Afghanistan by some estimates) the “war on drugs” developed a more intimate and powerful meaning for Inge. Drugs ravaged this country with violence and corruption. Working in Afghanistan for five years, Inge was involved with the Afghan legal system and their government, as well as with the U.S. Army and Marine Corps. Through her experiences, she observed how the U.S. drug policy caused Afghanistan to become a narco state. By classifying their number one export as illegal, it created a huge black market which contributed to government corruption and the victimization of civilians. With her experience from Afghanistan, Inge is now on the forefront of the “war on drugs.” Speaking around the state and country on drug legalization, this incredible woman is one of the most powerful voices for the cannabis industry. Amy, 40, entered the industry from a social justice perspective. After seeing a family member charged with a federal crime, she was inspired to become a criminal defense attorney. Growing up in Seattle, she saw too many friends and acquaintances being persecuted by the misguided inclusion of cannabis in the “war on drugs.” She could see people she knew losing their families and livelihoods. With a desire to help fight mass incarceration and mandatory minimum sentences, she pursued her career with fervor. Amy began her criminal defense practice in 2002. As her practice grew she saw more and more victims of prohibition. In January 2017, she joined GreenSpoon Marder, a firm listed among the “Best Law Firms” by U.S. News and World Report. As part of their Cannabis Law Group, one of her specialties is helping people in the cannabis industry with licensing and compliance. She addressed these issues in February of this year as a keynote speaker at the Cannabis Collaborative Conference. While she acknowledged that there might be setbacks as part of the worrisome changes in the political environment, she nonetheless saw it only as a temporary bump in the road, still confident in the long-term evolution of cannabis legitimacy. Margolis’ dedication to the cause is evident in her many achievements. Amy is the founder and director of the Oregon Cannabis PAC and the Oregon Cannabis Association. She speaks at countless events, not only across the country, but internationally as well. Amy Margolis is an inspiration to all. She is much more than an attorney and even more than an advocate. She is a relentless heroine determined to fight for fair treatment of those involved in all aspects of cannabis. Emma, 24, attended Brown University intending to study pre-med. After becoming disillusioned with western medicine, she found herself fascinated with the botanical roots of modern medicine. Switching her academic focus, she later graduated with a degree in Medicinal Plant Research. While working at the Brown University Oncology Research Group, Emma coordinated clinical oncology trials across the country, and encountered seemingly endless billion-dollar pharmaceutical trials. One day, a professor approached the board and pitched a marijuana trial which ignited Emma’s passions. This was exactly why she was doing this; to explore research behind alternative modes of healing! Unfortunately, the professor was essentially laughed out of the office. For Emma, watching the cancer industry’s money machine was the straw that broke the camel’s back. So, in 2015 she left her job, and packed up to pursue her passion. Knowing alternative medicine was more widely accepted on the West Coast, she and a friend moved to Portland. After two weeks in Portland, she found herself working as a budtender at a dispensary called Farma. She loves working with Farma’s co-founder Jeremy Plumb because of his passion and vision for the cannabis industry. Jeremy gives his employees a strong purpose and vision for the evolution of the cannabis industry, including more education, science and research. This was exactly what Emma wanted to do, and she has now transitioned to the role of Farma’s Director of Education. Her desire to promote alternative medicine goes further than cannabis, leading her to co-found Prismatic Paradigm. This company focuses on giving access to education of all medicinal plants and their ability to heal. From mint to lemon balm and much more, Emma wants to empower folks to eventually make their own medicines. She believes it’s a vital way to remove ourselves from today’s toxic healthcare system. Emma is obviously a passionate and driven individual. With a strong conscience and a bubbly, beautiful personality, she makes an incredible first impression. Her energy is as contagious as her knowledge is bountiful. Her dedication to alternative medicine and education is an immense contribution to the cannabis community! Lizette, 36, was born in Queens, NY and traveled back and forth from South America and the United States from a very young age. Cannabis didn’t enter her life until college and in 1999 she began growing with her boyfriend Lyle, who would later become her husband. In 2014, Lizette, Lyle and their best friend Ron, found themselves laid off at the same time Lyle and Lizette were starting a family. Deciding they had nothing to lose, they entered the cannabis industry. Because cannabis was not yet readily accepted, most folks wouldn’t lease any space to Lizette, for fear they would lose their property. Hoping for one particular location, Lizette was persistent with the owner, answering all her questions and concerns with honest and educated answers. When they finally found a sympathetic owner, Lizette and her team rented the property and began working towards their dream. Their first public venture was a dispensary called Cannabend. The store was stocked with edibles made by Lizette, as well as flower grown from their own garden. Since then, they have grown to outsource most of their products. Lizette has been determined to offer her employees, who she considers family, an opportunity to grow with her business. Joint Scullery is another of Lizette’s ventures. It’s a cannabis event-planning service for a variety of events that include private dinners, BBQ’s, weddings, and concert productions. They provide an assortment of smoking devices including dab bars and vape bars, among many others. As they are not a dispensary, they cannot provide cannabis for consumption. Lizette can, however, offer her industry knowledge to help procure party favors. Lizette has been an active voice in the cannabis community for a long time. With her hands in a variety of projects, she is dedicated to this community. Through her previous work with Women Grow and her new project, iCannabis International, Lizette is becoming a leader for women not only in Oregon, but throughout the nation. Anna, 29, is a co-founder of Sugartop Buddery along with her brother Jarrod, a medicinal grower who has lived in Oregon for over twenty years. Both East Coast transplants, Anna is an experienced oil painter and sculptor with her masters in Fine Arts. Jarrod is a world-class percussionist & seasoned musician, with a degree in Communications. Having deep roots within the arts and music communities, cannabis has been an influential and an essential part of both of their lives. Believing that passing around a joint can elevate people as well as ideas, Anna is rooted in the old-school mentality of social smoking. As a company, they decided that pre-rolls would be the most effective way of offering their strains to the widest variety of cannabis connoisseurs. In an effort to deliver the most consistent product possible, they mastered their own method, assembled with a process rhythmically described as, “sift, jiggle, massage, tap, twist.” To further set themselves apart, they also launched a fun rhetorical campaign to coin the term “Bat” as their distinctive style of pre-roll. As a community oriented business that strives to work with other local businesses, SugarTop enjoys supporting the arts in conjunction with celebrating the cannabis community. With events such as Tokes ‘n’ Treats, SugarTop is encouraging local businesses and dispensaries to cross promote. Anna is also one of the 2017 board co-chairs of Women Leaders in Cannabis, alongside Heidi Fikstad (Moss Crossing) and Johanna Williamson (Highly Distributed). WLC is a non-profit organization which promotes the normalization of cannabis by supporting business services and leadership opportunities for women. This women’s group is rooted in philanthropy, being actively involved in various fundraisers including food drives, toy drives and a free kids fair called “Spring Fling.” This incredible organization offers a place for women to collaborate in an environment that facilitates growth, fosters strength and promotes greatness. Anna is an inspiration to those who have the pleasure of knowing her. Starting with a dream, this young woman turned it into reality. Through determination, passion and a desire to raise up and encourage others inside and out of the cannabis community, Anna has soared to become an incredible example to others.